The first 38.14m Oyster 125 Flybridge model by Dubois, Twilight, is currently undergoing client sailing and acceptance trials this week in Turkey. Ed Dubois, the Naval Architect for the Oyster Superyachts, and also on board for the trials, expressed his delight that the team has found a comfortable balanced design, offering exceptional utilisation and ergonomics of interior space providing a living environment usually only found in much larger yachts. Sea trials for potential new clients are likely to be scheduled for May in a central Mediterranean location. 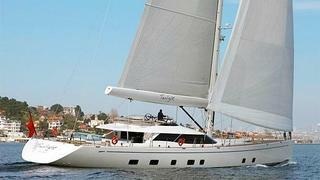 Twilight is available for sale with Dubois Yachts and Oyster Yachts, asking €16.8 million.